Located in Lewiston, Idaho, Speer ammunition has built an impressive reputation among law enforcement personnel. 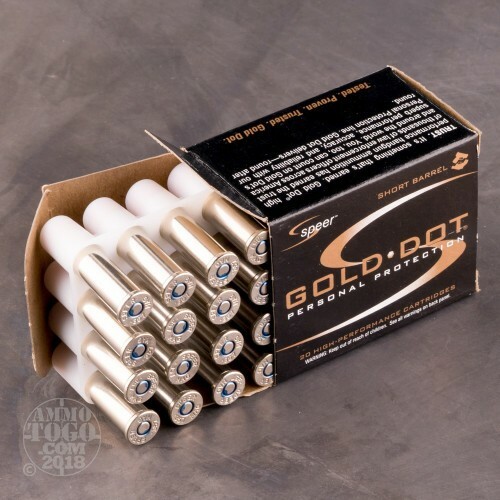 With consistent quality and performance, Speer’s Gold Dot line of ammunition has become the preferred duty rounds of police departments across the country. These rounds are also an excellent choice for civilian personal protection. 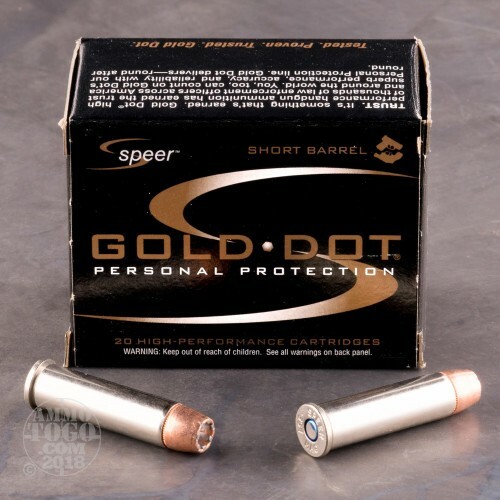 This package contains 20 rounds of Speer Gold Dot Short Barrel .357 Magnum ammunition. Each round is loaded with a 135 grain jacketed hollow point projectile. Designed with a special bonded jacket, these projectiles deliver superior weight retention and hard-hitting terminal performance. 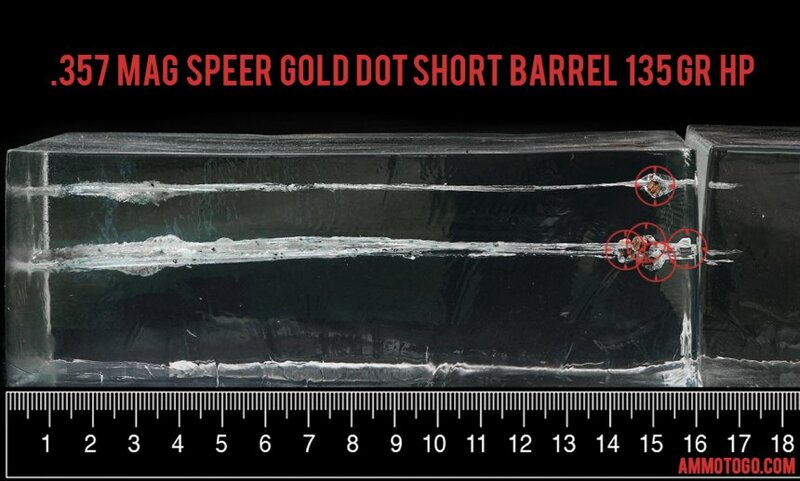 Speer Gold Dot Short Barrel loads are engineered specifically for compact, short-barreled weapons. This is the ultimate round for compact concealed handguns, delivering optimum close range expansion and producing suitable velocities, even with a short barrel firearm. This ammunition is factory fresh, non-corrosive, and boxer primed. Each round is loaded in a nickel-plated brass casing for smooth feeding and function. These highly visible casings also make loading easier in low light conditions. Each round produces a muzzle velocity of 990 feet per second and 294 foot pounds of threat-stopping muzzle energy. As you hunt for the best self-defense 357 Magnum ammo, we thought you might enjoy seeing the results of some testing we recently conducted with calibrated Clear Ballistics gelatin. We shot five of these Speer rounds through a four-layer cloth barrier using a S&W 640. The results are detailed in the video you see above as well as the photographs. Through the charts, you should get a great idea how this Speer ammo stacked up relative to other 357 Magnum ammo products available to American shooters. 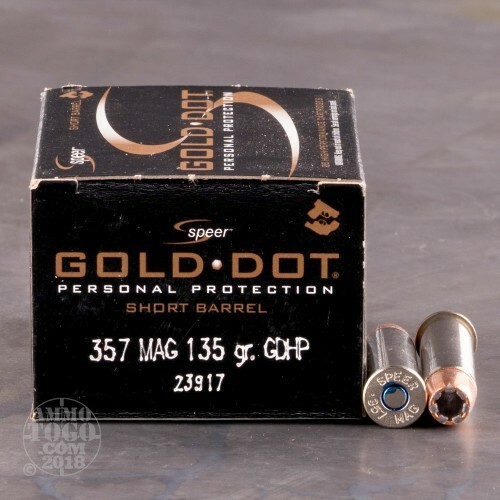 How do the results for this Speer 357 Magnum compare to other 357 MAGNUM? 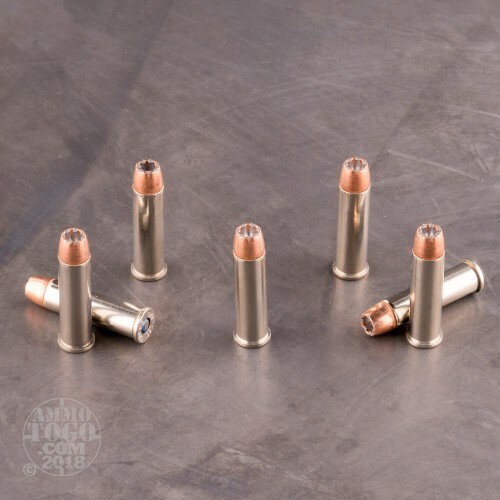 Expansion Diameter Compared to All 357 Magnum Ammo Tested MIN 0.35" MEDIAN 0.55" THIS AMMO 0.55" U.S. dime MAX 0.75"
Penetration Depth Compared to 357 Magnum Tested 0" 10" 20" 30" MIN 9.2" MEDIAN 17.3" THIS AMMO 15.2" MAX 41.7"
This new 357 round from Speer has a special nitche for Smith & Wesson J-Frame magnum revolvers. Lighter power (and recoil) than a standard 357 but delivers more punch than a 38 Special +P round. The larger frame revolvers can handle full power 357 magnums. The perfect ammo for my Taurus 617. Very accurate and a good self defense ammo. This new 357 round from Speer has a special niche for Smith & Wesson J-Frame magnum revolvers. Lighter power (and recoil) than a standard 357 but delivers more punch than a 38 Special +P round. The larger frame revolvers can handle full power 357 magnums but until now the J-Frame magnums have been tough to handle with full power loads. Try these in your small frame revolver and you will be pleased.